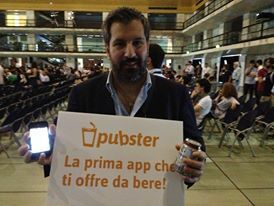 Pubster, a Rome, Italy-based provider of the app “that gives you free drinks” raised an equity funding round. Neither the amount of the deal nor the names of the private backers who made the investment were disclosed. The company intends to use the funds to expand nationwide beyond Rome, where the platform is already growing, starting with Milan. Led by Andrea Pastina, CEO, Gabriele Fronza, CMO, Davide Caroselli, CTO, and Silvia Salvadori, business development, Pubster has developed and now offers an app that gives free drinks to its users! Available both for iPhone and Android devices, It allows users to access to free beers in pubs of the Pubster’s network by collecting virtual coins, every time they go to the pub. As Gabriele Fronza explained to me in a recent interview (read it here), venues have the opportunity to increase their loyalty and the retention rate by inducing customers to come back and grow sales. The startup was incubated by EnLabs, the Rome-based world-class accelerator.